Whether you're an old pro, someone who wants to improve his skills or a novice who wants to learn how to play, Grandmaster Chess Tournament has the features you're seeking! Experts will appreciate the challenge of playing against the computer at one of the higher difficulty levels. Intermediate players will enjoy playing at the lower difficulty levels and using hints to learn new tactics. And novices can begin their training with the tutorial and work their way up from there. 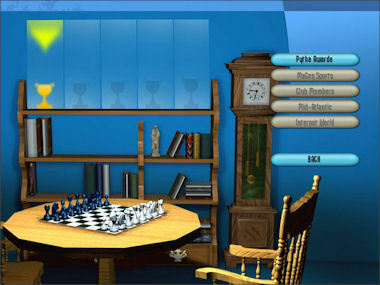 All players will take pleasure in the advanced visual presentation in Grandmaster Chess Tournament, which includes three eye-catching environments, 2D and 3D viewing modes and a highly refined user interface that makes playing the game as easy as sitting in front of an actual chess board. With its sophisticated artificial intelligence and superior graphics, Grandmaster Chess Tournament will please veterans and casual gamers alike! This could be the last chess game you'll ever need!